Pep Guardiola lifted his 22nd trophy as a manager and his first in England and in charge of Manchester City after beating Arsenal 3-0 in the League Cup final at Wembley. City were slow to start in the first half but were still winning at half time but they came out and outperformed Arsenal in the second half to win comfortably. Here is what I learnt from the game. Sergio Aguero, Vincent Kompany and David Silva. These are arguably the best three players to grace the club and along with Yaya Touré have been the flagbearers of a great era for City. Guardiola is ushering in a new era with a significantly younger team, many of whom won their first career silverware today, and the lowering of the age of the squad has helped massively. But these three were on the scoresheet and also the main men in a showing that wasn’t the vintage Guardiola City that we’ve grown accustomed to seeing this season, but were still comfortably the best team on the pitch. Aguero’s finish was a work of art. Kompany showed great desire and skill to win the corner from which he scored and also defended brilliantly. Silva ran the show in midfield along with De Bruyne and Gundogan. Their time may be drawing to a close, but they’ve still got a lot left in their tank. For what seems like the first time in many seasons, City have a surplus of good players to play at centre-back. Otamendi has cemented his place as first choice with great consistency this season, Stones had looked like the Kompany heir we all wanted before his injury, and Laporte is the club record signing and has impressed when played. Now with Kompany delivering performances like this, Pep really has a dilemma on his hands – what is the first choice pairing to play in the big games when Champions League quarter finals come about? As good as Aguero is, he cannot play every single game and needs to be handled carefully with a fixture glut coming in the next few weeks. That’s why it was great to see Sané give a decent performance and get fitness back in his legs and then be subbed off for the return of Gabriel Jesus, who returned after being sidelined for two months. The pace and energy of these two, along with Sterling, who was sidelined with a hamstring injury, is a key part of City’s attack and they have looked a little less lethal without them. Can we cope without Fernandinho? Fernandinho is the one player in the team who does not have a straight back up. Touré is there but he is not at the level needed to play for this team, especially in matches against good sides that play fast paced football. With Fernandinho sidelined for the coming couple of weeks, maybe even more after tweaking his hamstring, it will be interesting to see who Guardiola plays in his place. Many expected Gundogan to go to defensive midfield but it was Kevin De Bruyne who dropped deeper and with City having a vice like grip on proceedings, there wasn’t too much cleaning up to do anyway. The team sheet against the same opposition on Thursday will give more answers. Is the treble a possibility? 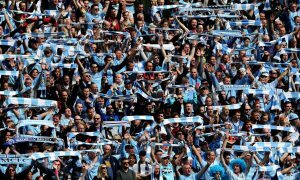 With domestic cup commitments over for the season and the league in the bag barring a huge catastrophe, the Champions League is the main remaining concern for City this season. Already with one leg in the quarters, the draw will be interesting as a well-rested and motivated City could give any team in Europe a run for their money.